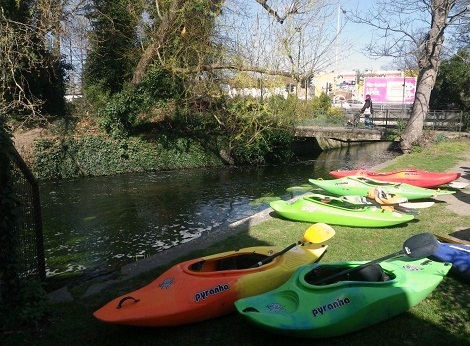 What a wonderful Wandle trip it turned out to be. With the regular Wandle wanderers, and several new to the delights of our own little Thames tributary, the sights were mostly a pleasure. The ‘animal’ life included coots, yellow wagtails, an Egyptian goose, a couple of shoals of fish, as well as the ubiquitous pigeons, a fox, a cat doing a daredevil walk across a fallen tree to cross the river, a large bird of prey devouring a pigeon (we subsequently were informed it was either a (Golden Eagle or Harris Hawk), and even a couple of other kayakers in ‘proper boats’ according to you know who, (long, fibreglass and very old!). The sun shone and the air temperature rose, there were also a few rosy faces by the end of the trip – suncream having been thought unnecessary in London in April. Water levels were, not surprisingly, low, so a few groundings occurred along the way (one disturbingly, in the darkest bit of the Southside shopping centre tunnel). With quite a large polo contingent, it was inevitable that the ball found in the reeds, journeyed down a fair part of the river with us! The ‘park and play’ wave provided a bit of fun, a few flat spins accomplished, a bit of wall bashing and tipsy moments for some. One section that is usually very shallow even after rain, has had dams built, which created an entertaining zigzag route to scoot around. 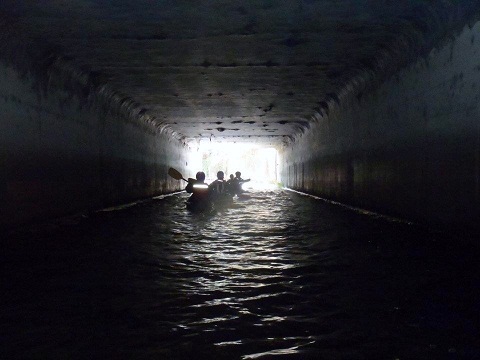 We weren’t anticipating the first large pipe across the river to be a problem due to the low water levels, and to be fair it wasn’t so much the pipe as an attempt to break out above it, that nearly did for one of our group – hair wet, but stayed in her boat. Well done to her and her rescuer. 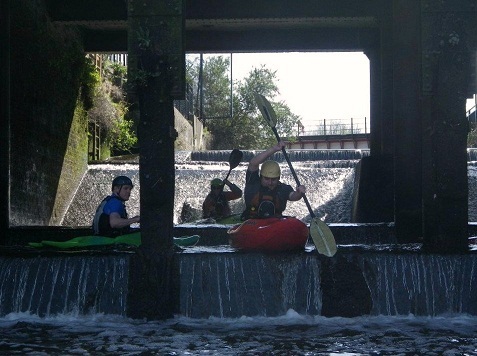 A slight miscalculation of the state of the tide, saw the group finishing the Wandle with several exciting drops over the final weir. Followed by a not too arduous paddle up the tideway and back to the clubhouse, aka the container. Well, it was April 1st. Many thanks to Rob, for a fabulous day.